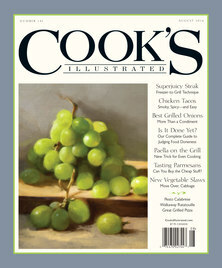 Of course I’ve heard of succotash, but it wasn’t until the latest issue of Cook’s Illustrated that I really knew what it was; a corn and bean side dish. While Chris Kimball published this basic recipe (using butter beans); I made a variation that included bacon, poblano and cilantro. It was very quick and easy to make; almost all the effort was in preparing the vegetables. I was surprised at how delicious this simple side dish was; both my two sons loved it. The flavors were fresh, and rest of the flavors offered great depth. 4-1/2 stars. Chris Kimball warns against using frozen or canned corn in this dish. After tasting the dish, I see how important the freshness is to the success of the recipe. While I agree, that also means that this is a very seasonal dish. I read that it is traditionally served around thanksgiving in New England; a time of year when there is no fresh corn. Start: 5:30 PM. End time: 6:00 PM. In a small bowl, mix together 2 tablespoons of liquid from beans with the 2 teaspoons lime juice. Set aside. Rinse the rinse beans and drain in a colander. 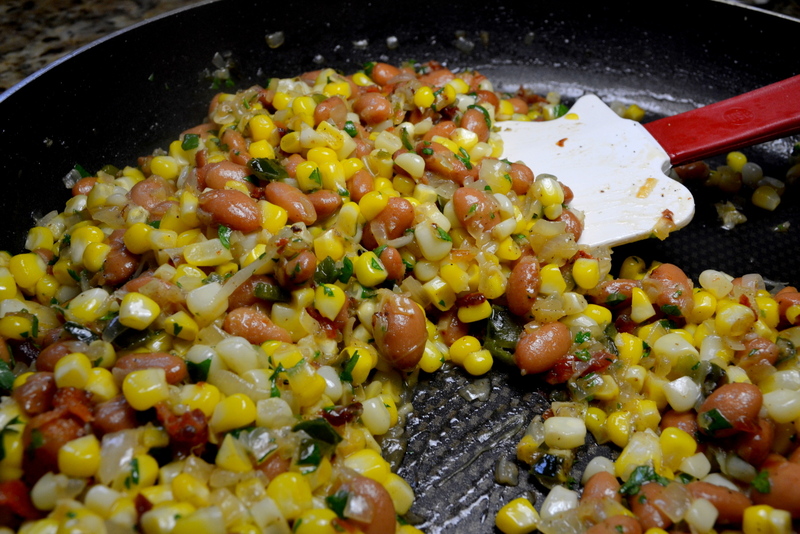 Cut off kernels from ears of corn, and set aside with rinsed beans. Finely chop your onion, and cut your 1/2 poblano into 1/4″ pieces. Peel and mince your two garlic cloves. Chop bacon and cook in a 12″ non-stick skillet over medium-high burner for 5 to 7 minutes. Once crispy, use a slotted spoon to remove bacon to a paper-towel lines plate and set aside. Add 2 tablespoons butter to skillet with the bacon fat, add chopped onion, diced poblano, and 1/2 teaspoon salt to skillet. Saute vegetables for 4 to 5 minutes under they begin to brown. Add minced garlic and 1/4 teaspoon ground coriander; cook for 30 seconds. 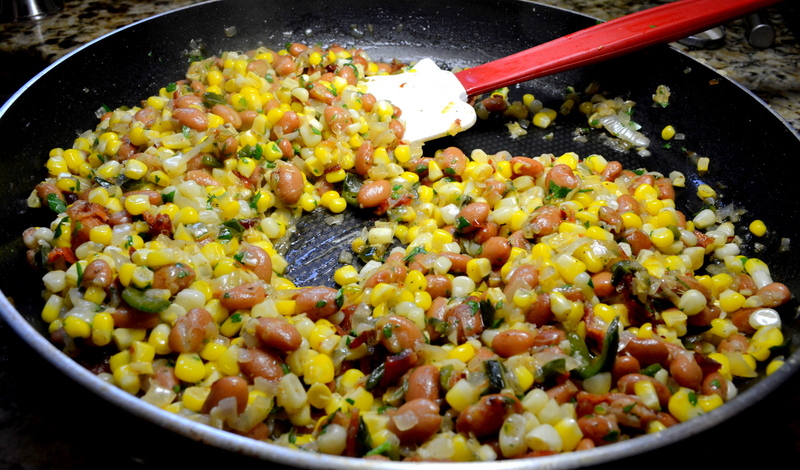 Turn down burner to medium; add corn kernels and rinsed beans. Cook for 4 minutes; until corn and beans have cooked. Add bean liquid/lime mixture and cook for 1 minute. Remove skillet from burner; mix in minced cilantro and adjust salt and pepper according to your taste. Sprinkle with crispy bacon and serve. This entry was posted on Monday, June 8th, 2015 at 7:18 am and is filed under 2015 Recipe, Side. You can follow any responses to this entry through the RSS 2.0 feed. You can leave a response, or trackback from your own site.